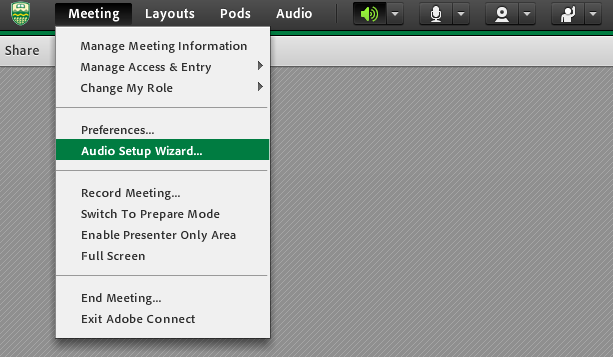 If you decide to use audio for either listening or broadcasting, be sure to run the Audio Setup Wizard and go through the steps. Enabling Microphone Rights For Participants will allow users to use their microphones all at once. Requires more bandwidth compared to Single Speaker Mode (See below). 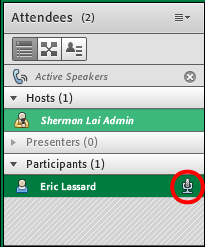 Enabled Microphone Rights are indicated by the microphone icon next to each user. This mode restricts the microphone to one speaker at a time. Requires less bandwidth at the cost of the number of concurrent speakers. An asterisk appears next to the microphone button when it is enabled.